BookMyne™ makes it quick and easy to access the library on the go! 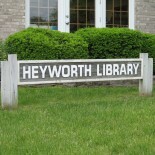 Search Heyworth Public Library’s catalog, place holds, manage your account, renew items, and more. The app is available from Google Play and the App Store. • Use your device’s camera to scan the barcode on a book, audiobook, CD, DVD, or other item at a friend’s house or bookstore and search for available copies at your library. • Keep track of your library account and manage your checkouts, renew items, and place holds.